The injections must be done by people with medical education. 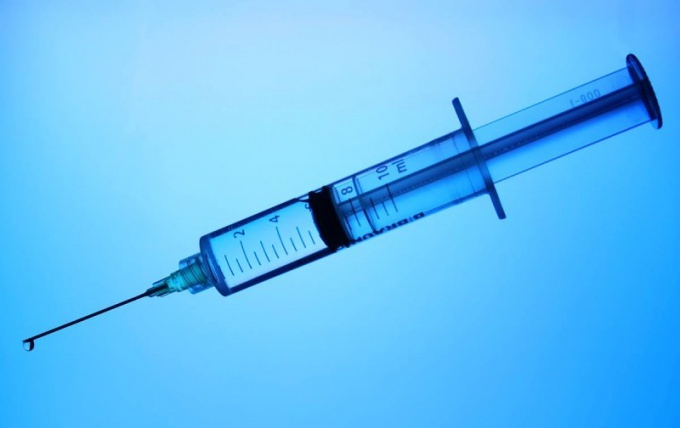 However, if you have been prescribed a course of intramuscular injections, and you will not be able to go to the nurse in the hospital will have to carry out this procedure at home, involving the process of loved ones. Note that the syringe for intramuscular injection must be long needle. Strictly prohibited to inject the buttocks with a syringe with a short needle. The fact that she might not get to the desired muscles. As a result, the medicine will be given just under the skin, which could trigger inflammation. Once you have prepared all the necessary for the injection, ask the patient to take a comfortable situation for him lying on his stomach. In this position the muscles are most relaxed, making the injection will be less painful than standing. 2. Take a vial of the drug, easy click of a finger tip shake off the remnants of the drug, and then carefully wipe it with alcohol. 3. Special nail file or a knife will nagelite and snap off the tip of the ampoule. 4. Draw up the medicine into the syringe. 5. Put the syringe in a horizontal position, needle up. 6. Slightly click on it with your fingers, once the air remains as bubbles merged into one. 7. Then slowly push the syringe plunger, pushing the air bubble. Wait until the needle drops. Now get ready to do the injection. To find the right spot for the shot, you must mentally or with the aid of iodine to outline the buttock into 4 equal parts. The desired point is within the upper extreme of the square. This is an area you do not risk damaging the sciatic nerve. Wipe the injection site with alcohol. Hold the syringe with typed injection in the working hand and the free hand to stretch the area of skin (when injecting an adult). Or do the opposite - create a skin fold, if you make an injection to the child. At an angle of 90 dramatically with cotton ¾ insert the needle into the muscle. By pushing the plunger slowly start to inject the drug. The rate of administration depends on the particular medication, so carefully read the instructions of the drug. Important: do not insert the needle until it stops. Moisten a cotton pad with alcohol and squeeze them a shot, sharply removing the needle at an angle of 90. In conclusion, massage some time damaged muscle. never make injections previously used syringe and needle. Note that the 2 CC syringe needle is thinner than a 5-bottoms. Except the boring theory, there are multiple instructions in a video format, which is clearly shown and described in detail the correct procedure of intramuscular injection in the thigh.